Pike chowder is not necessarily a common meal, but the way Dan makes it will cause you to make it a common meal in your home. 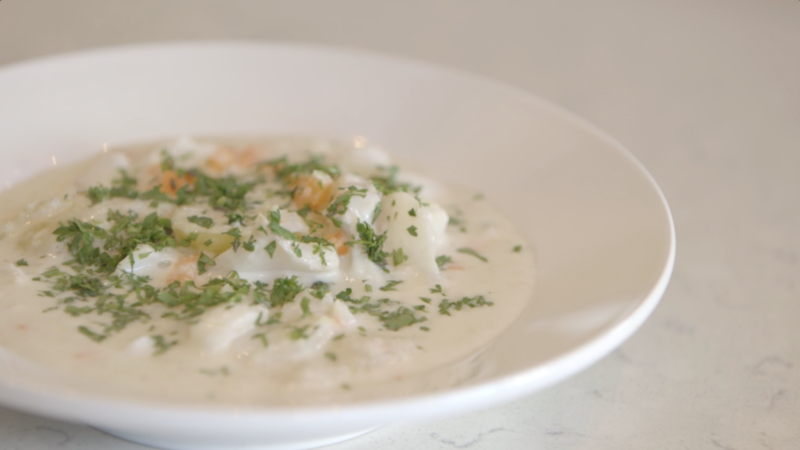 This dish is so good that it might turn you in to a chowder head. • Start by poaching pike: Fill a high-rimmed frying pan with water, 2 stalks celery, 1 onion cut in half, a small handful of thyme sprigs, and a small bunch of parsley. Bring that to a gentle simmer. • Lay pike fillets in simmering water and maintain a gentle simmer for approximately 10 minutes until fish is cooked and tender. • Get a pot on medium heat, and add 1 tablespoon olive oil. Add 2 sticks celery cut into ¼ inch dice, and sliced back bacon. Let cook about 5 minutes until softened. • Add ¾ cup whipping cream, and ¾ cup stock and blend until smooth. • Remove pike from poaching liquid, and flake it into the blended chowder base. • To the chowder, add 3 blanched, sliced potatoes, and 1 large diced carrot. • Leave on heat for 10 minutes or until the carrots are tender. • Season with salt to taste, and garnish with minced parsley.